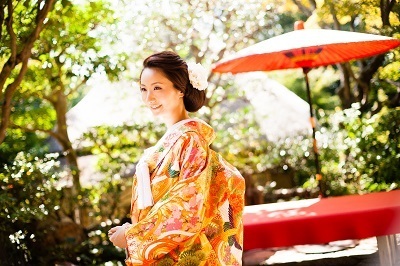 A style with a “wig” makes authentic Japanese bride. A gorgeous “Western hair arrange”. Our popular “Fitting event of wedding kimono, wig and Western hair arrange” will be held on Sundays, May 1st and 8th. You can actually try “Shiromuku (all white kimono)” and “Irouchikake (kimono with colors & patterns)” with matching wigs and western hair arrange. Before trying, some brides-to-be were nervous about how they would look with a wig. But most of them found themselves pretty and said they were happy that they tried.